Fast clicking sounds can boost brainpower in mice with signs of Alzheimer’s disease. 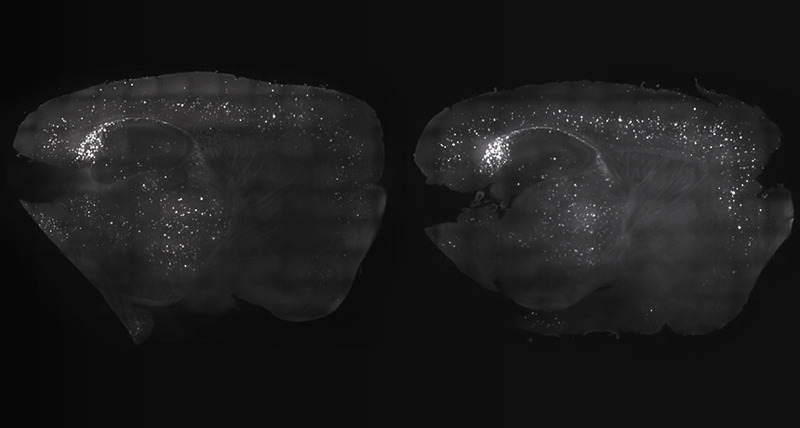 Like flickering lights, these external sounds spur a type of brain wave that seemed to sweep disease-related plaques from mice’s brains, researchers report in the March 14 Cell. It’s too early to say whether the same sorts of flickers and clicks could help people with Alzheimer’s. If so, the treatment would represent a fundamentally new way to target the neurodegenerative disease — with lights and sounds instead of drugs. An earlier study of mice, by neuroscientist Li-Huei Tsai of MIT’s Picower Institute for Learning and Memory and colleagues, focused on the eyes. Lights that flickered exactly 40 times a second (a “twinkling” effect, Tsai says) kicked off gamma waves, a type of brain wave thought to happen during concentration. In mice, these brain waves somehow reduced amyloid-beta, the protein that piles up in the brains of people with Alzheimer’s (SN: 1/21/17, p. 13). But in that study, A-beta was reduced only in the part of the brain that handles vision — an area not thought to be key to Alzheimer’s progression. Sounds that hum at a rate of 40 clicks per second, or 40 hertz, do the same trick of spurring gamma waves and clearing A-beta, but in a more relevant part of the brain — the hippocampus, a structure that is important for memory and that’s affected by Alzheimer’s, the researchers found. A daily hour of fast clicks, played by speakers above the mice’s cages for seven days, also improved the memories of mice genetically engineered to have signs of Alzheimer’s. Compared with mice that heard randomly spaced clicks, mice that listened to 40-hertz clicks were faster in finding a hidden platform in a water maze, and better at recognizing an object they had seen before. “That’s a very exciting finding, that it can actually affect cognition,” says neuroscientist Tara Tracy of the Buck Institute for Research on Aging in Novato, Calif., who wasn’t involved in the new work. In ways that the researchers still don’t understand, sound-triggered gamma waves seem to kick off other beneficial changes in the brain, too. In the mice, levels of a harmful form of tau in the brain, another protein implicated in Alzheimer’s, dropped, and blood vessels in the brain expanded, perhaps easing the disposal of A-beta. Immune cells called microglia also bulked up and grew more active, attacking A-beta.